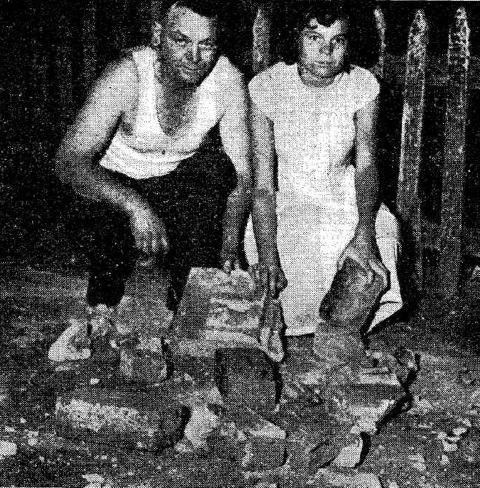 Today marks the 60th anniversary of an earthquake that struck Adelaide at 3:40am local time on 1st March 1954. The magnitude was about 5.6, the epicentre perhaps 10km south of the city on the Eden Burnside Fault. Widespread damage was done, only 3 people injured, and no one killed by some miracle. This event caused the highest economic loss of any earthquake in Australia until eclipsed by the 1989 Newcastle earthquake which was the same size and a similar distance from the city. Like Newcastle there were few if any aftershocks. View the gallery of photos from this earthquake. The worst earthquake in Australia rolled across half of the State early on Monday morning. Heavy tremors, lasting up to 30 seconds, terrified tens of thousands of people when their houses shuddered, and caused thousands of pounds’ worth of damage. Although only three people were injured, many had narrow escapes from falling masonry and debris. In the metropolitan area some districts were blacked out for about two hours. Many people leapt from their beds, rushed outside and remained there until dawn. A daylight survey revealed that many big city buildings had been cracked, and in some cases parapets had moved about two inches. People in city hotels and boarding houses groped their way into the streets in the darkness after they had felt the buildings rocking. At police headquarters the wireless aerial masts swayed nearly six feet, the top floor rocked and heavy transmitters slid around the floor while officers on duty struggled to keep on their feet. Policemen patrolling the city were thrown against shop windows. Windows were broken in many large city buildings and glass showered into the street. City Council employes barricaded off a number of areas considered dangerous from falling masonry. Three casualties were reported. Mr. and Mrs. N. H. Gilbert, who occupy a flat in the Queensland Insurance Co. building in Pirie street, were awakened by rumblings which were quickly followed by the noise of shattering glass. Bricks and mortar fell from a block of eight chimneys on adjoining premises. Some crashed into a lane way and the rest smashed the windows of the Armored Division clubrooms. The ceilings of most offices in the Queensland Insurance Co.’s building were cracked. Minor damage was caused to the GPO, where several walls were cracked and the parapet surrounding the top of the building was loosened. The northern face of the GPO clock was smashed, but the tower was undamaged. Among the premises barricaded off to protect pedestrians was the Commercial Insurance Co.’s office in Pirie street. The large statue of Britannia on the top of the three-storey building was cracked across the base. A coping stone, weighing about a quarter of a ton, on the top of St. Francis Xavier’s Cathedral, Wakefield street, cracked and shifted about five inches. Police and firemen barricaded off the front of the building. Following an architect’s report, contractors roped the stone until it can be pinned into position. Cracks appeared in the walls of the 102-year-old Pirie street Methodist Church and a part of an ornamental fixture in the centre of the ceiling broke away. The spire at Archer street Methodist Church, North Adelaide, was barricaded off and will have to be removed. Toppling chimneys at Bishop’s Court, North Adelaide, did severe damage to the house, which was recently modernised. Bricks fell both outside and inside the building. Clocks stopped dead with the first jolt at 3.40a.m.